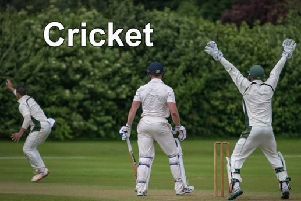 Woodhall Spa Cricket Club’s FirstXI succumbed to a 62 run defeat at home to high flying Sleaford on Saturday in the Lincolnshire ECB Premier League. Despite the defeat there were many positives to come from the game for Jack Luffman’s young side, who fell to seventh in the table after the weekend. After winning the toss the home skipper elected to bowl in favourable conditions and on a pitch that had been under cover all week due to the terrible weather. His decision was justified as his seam bowling attack put the visitors’ strong batting line-up under pressure and reduced them to 59-3. Jean-Pierre Prinsloo and Alfie Lindsey opened the bowling and were unlucky not to take a wicket each during their early spells as they beat the bat on numerous occasions and Prinsloo, in particular, had two very strong LBW appeals turned down. However, it was the introduction of last week’s hero Joe Irving that accounted for two of the first three wickets to fall and then an excellently executed run-out from Chris Anderson sent opener Mountain on his way. At this juncture the visitors’ overseas professional Obus Pienaar, on the back of three consecutive centuries, and the experienced Oliver Burford were joined together and after some luck and following the drinks break they took the attack to the Spa bowlers and put on a partnership of 136. The home side stuck to their task well and when Irving had Burford caught for 63 and then Ross Dixon bowled Pienaar for a fine 78 it looked like maximum bowling points could be on the cards. However, the final total of 224-8 would’ve pleased both sides. Irving 3-51 and Dixon 3-45 were the pick of the bowlers. The home side’s reply got off to a disastrous start as the top three batsmen were back in the pavilion with just 14 on the board. The task of chasing down the total suddenly became even more trickier. However, all was not lost and Irving (39), Anderson (33), Matt Sargeant (23) and Dixon (27) continued to play their shots to try and push their side towards the wining line but with wickets falling at regular intervals and some tidy bowling and fielding form Sleaford the challenge on this occasion was just too great for the home side. Away at Sleaford the Second XI put in a good bowling and fielding display to bowl out their hosts for 189. Skipper Pete Jackson decided to open the bowling with seamer Jack Cooke and spinner Rob Bee and this became justified with the latter taking a wicket with his second ball while Cooke also took a wicket in his opening spell to reduce the home side to 15-2. However, a partnerships of 50-plus then ensued before Connor Parsons joined the attack to take two wickets. From that point on Spa took wickets at regular intervals to keep the home side to a par score on a good batting wicket. Bee claimed 3-45 but it was skipper Jackson who was the pick of the bowlers claiming 4-30 form his 11 overs. In reply, the Spa batsmen found run scoring difficult against a good attack and were bowled out for just 91. Adam Barker (10), Parsons (19), Andy Scoley (10) and Sam Cherry (17 not out) were the only batsmen to reach double figures. On Sunday, the Wanderers Seconds travelled to play their Hartsholme counterparts and came away with an 18-run victory. Batting first on a slow wicket, Adam Barker’s side were indebted to club coach Paul Timby who scored 77 of his side’s 114, with no other batsmen reaching double figures.